Even with all that info it's still easy to make a mistake. Take, for example, the 1936 Dorsey. Up until I started to do this post I thought I had my hands on a 1937 Cameron. The name Cameron is shared by someone very special to me and it's a watch I've been looking to get for quite a while. But no... it turns out it's a Dorsey. Oh well, the hunt continues. The Dorsey was introduced in 1936 and made for three years. 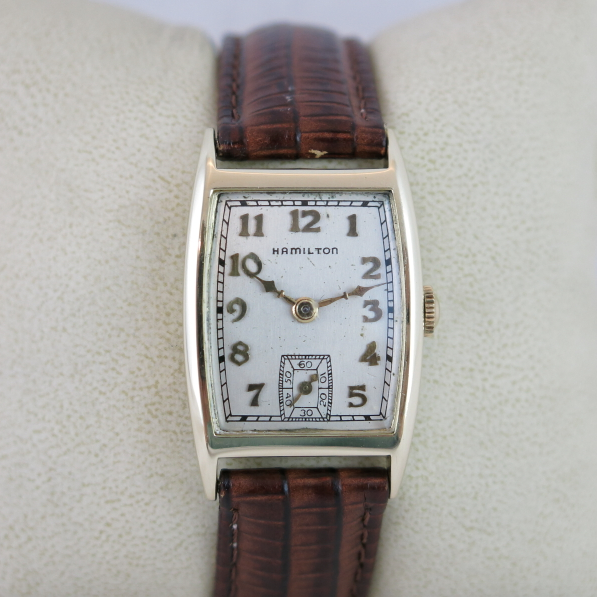 It comes in a solid 14K yellow gold case with a choice of an applied gold numeral dial or a two-tone black enamel dial as shown in the catalog ad. 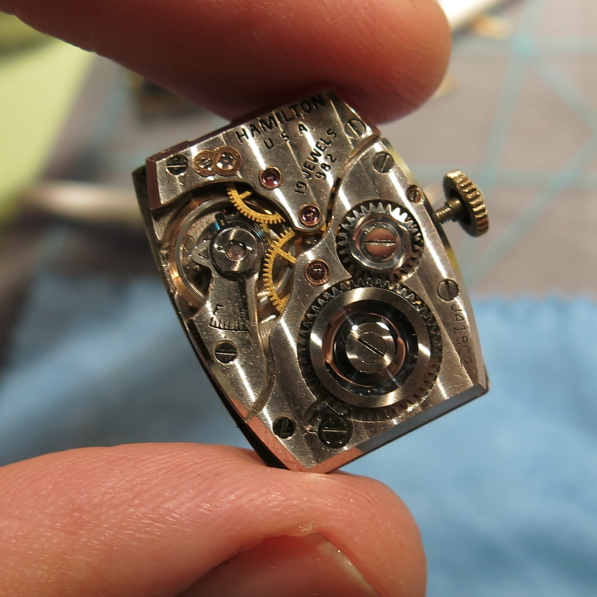 Under the dial you should find a 19 jewel 982 movement. The Dorsey should also have solid diamond-style hands. As I stated above, I recently purchased a Dorsey thinking it was a Cameron. I started to think I might have made a mistake when I began to clean the watch. I have a new crystal awaiting the arrival of a Cameron but the crystal I have is too narrow for the case. There's actually another solid gold Cameron from the 1950's. It's very similar so I thought maybe I just had the wrong crystal. 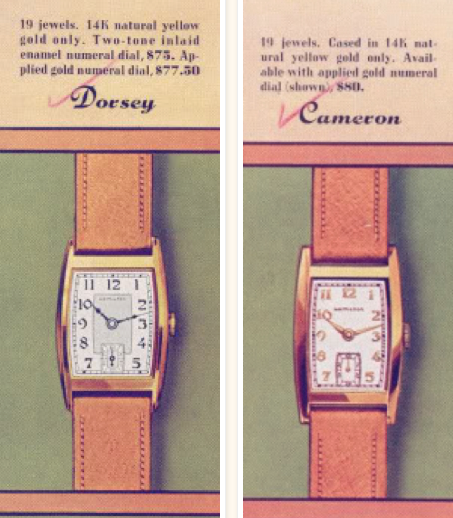 If you look closely at the advertisements you can see the Dorsey has a slight curve to the sides of the bezel opening while the Cameron is straight. That was my first major clue. Otherwise they are really quite similar. Anyway, here's a shot of my project watch as it arrived, without the old strap that was on it. It was in nice shape and just needed a trip to the basement spa. The dial is pretty good but based on the flat-finish I suspect that it's an old refinish. It doesn't look bad at all - it just doesn't look 70+ years old. The 982 movement is running - as you can tell by the blurred balance wheel. 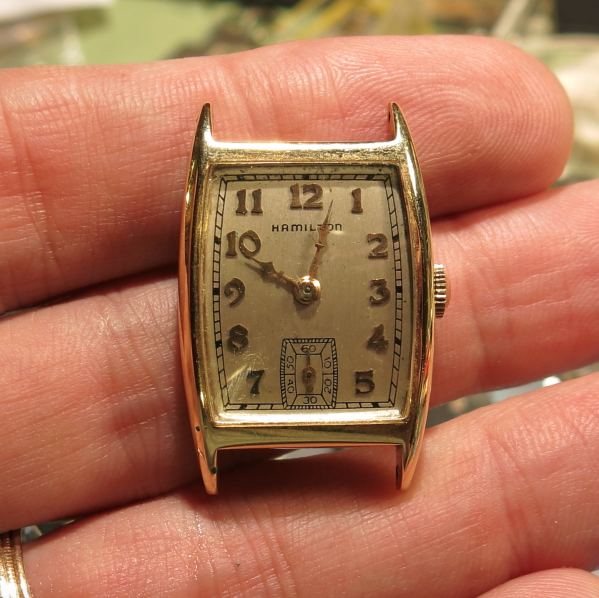 The serial number dates this watch to 1938 - the final year of the Dorsey. 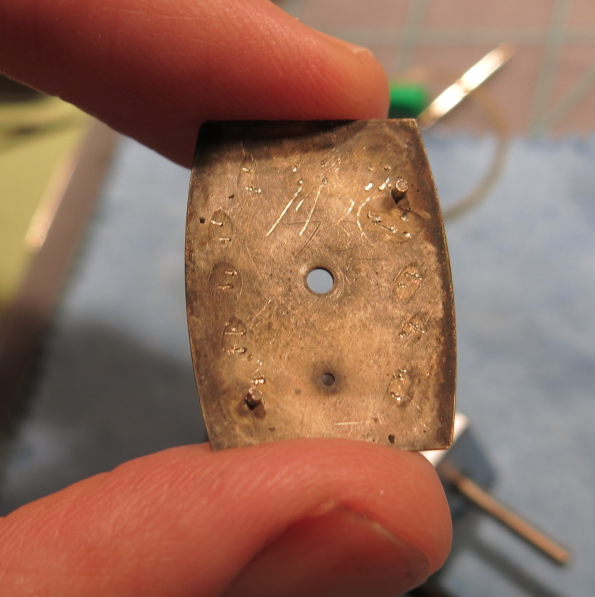 Sure enough, close inspection of the back of the dial reveals some scratched in numbers - a sure sign the dial was refinished at some point. 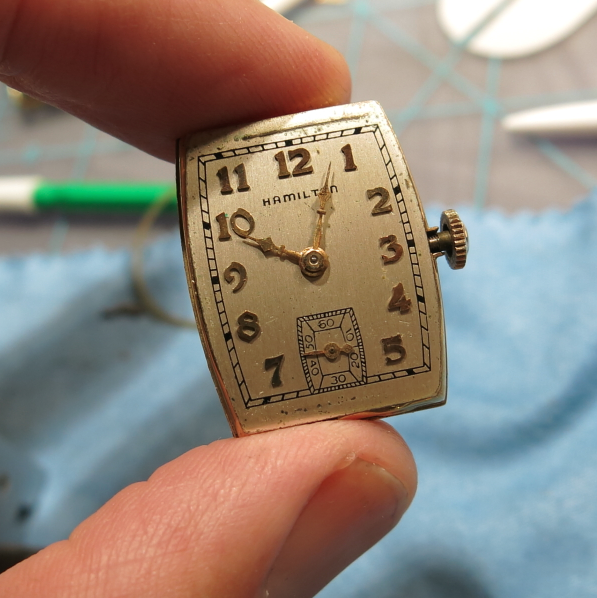 As long as the pattern used is correct, getting a dial redone is not a big deal. A nice looking redial is better than a crappy-looking original in most cases (unless the dial is super-rare). After a thorough cleaning the watch is reassembled and put on a fresh strap. This Dorsey is now ready for some wrist time. I'll probably sell it though - so I can free up the funds to find my long awaited Cameron.